“Know Thyself”, in Greek letters, was the first tattoo I ever received. It is by far my favorite tattoo because it always seems to become relevant in my daily life. I remember sitting in my Ancient Greek history class in college and listening to the teacher talk about the Oracle at Delphi. In Greek letters written above on the archway were the words “Know Thyself” which my professor went on to explain in great detail their importance. In order for someone to be able to heed the oracle’s advice, they must know themselves first or how could they hope to heed her words? If someone can not be honest with themselves, how can they be honest with others? If they can’t see for themselves who they are, understand their motivations, and know themselves, perhaps the way God does, then what can they truly learn or hope to learn? There has been recent controversy about a local church practicing conversion therapy for the LGBTQ community close to where I live. I have been to this church’s free play-scape many times, met other moms there, and it has been a great resource in thw winter. I was quick to have an opinion but slow to take sides. However, I felt it was an issue I neeses to educate myself about and chose whether or not I would continue to patronize their play scape and cafe. There has been much misrepresentation and hatefulness about this issue and if you’d like to learn more you can visit here to see the initial, albeit somewhat truncated post that was screen-shotted and posted by Metrotimes. 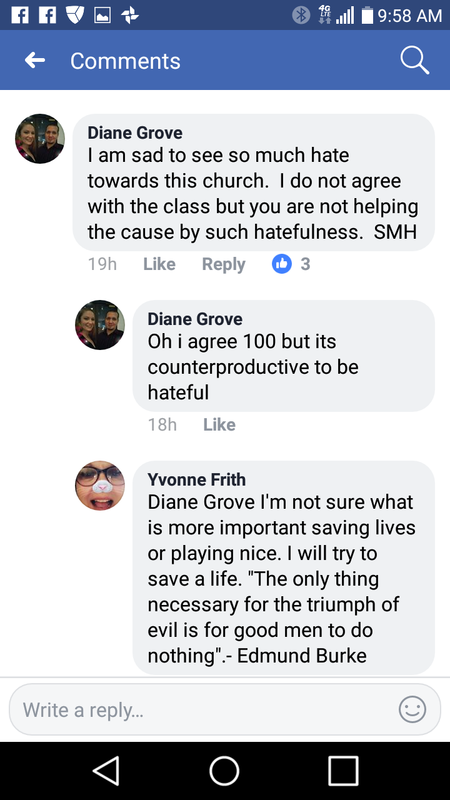 Here, you can see the pastor’s response and here you can see the fb page for the peaceful protest planned. 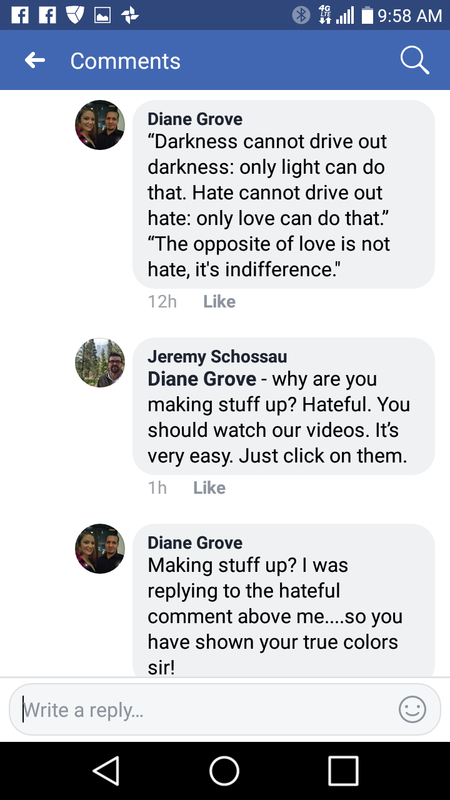 Below is my own interaction with the pastor that finally settled my mind on his character as I, trying to better understand his intentions versus the backlash, found out that he is probably just as bad as everyone says he is. My mom taught me to give people the benefit of the doubt and I believe that being quick to anger causes mistakes and misinformation, however, God must have wanted me to see clearly the situation and now I know where I stand. This controversy does relate to my post title below the screenshots. The reason I felt compelled to write about this is because I, like many of you out there, know someone who has struggled with their identity or sexual orientation and they are trying to know themselves in a world where we constantly try to tell people who they are. Today, especially, as I pass homeless people on my way home from a field trip and am taking my kids to a satirical play on race issues called the ‘Colored Museum’ soon, I begin thinking about my kids and how they will behave when confronted with such issues. I don’t want my kids to blindly follow any bandwagon but rather have an informed opinion, even if it seems wrong to others. Would my kids defend the church because they are Christian Catholics? or would they jump to defend the LGBTQ community without question? Would they “know themselves” and be willing to understand their motivations and choices? I never want my kids to make choices without understanding why they have made those choices or chosen to side with one over the other. Teaching someone to be hinest wirh themselves is not an easy task. Many adults are happy in theie self deception and I don’t want to raise more adults like that! Homeschooling has been opening my eyes to so many issues and ideas I had been blind to before. I’m learning that teachable moments present themselves EVERYWHERE! EVERYDAY! and I only have to accept the challenge of teaching them how to do the laundry or why we must give to the homeless or even explaining why we can no longer go to the free playscape.. I explain my motivations and also hope that my actions speak volumes over what I may or may not say. Sometimes homeschooling is talking about why we feel the way we do or what is going on in the world and one of THE MOST IMPORTANT things I am realizing is that I want to teach my kids for them to know themselves, because then they can be honest with themselves about their own choices and honest with other people too! They will be successful, caring humans and honest people. Explaining in simple terms why we can’t go to the free play-scape that Metro City Church runs anymore is hard and I obviously can not explain in every detail. BUT, I hope that by showing them the key parts to that decision will help them evaluate the world around them in the future, even if its not for years to come! Today is the first day of the rest of their lives and I want to look back and know that they saw me act with integrity, love and understanding!